It's called The Lookbook, and it's a collection of all of my outfits from the past 10 years of Permanent Style. One hundred and sixty-five outfits, all with titles indicating an interesting aspect of them, and linked to the post in which they appeared. There are double-breasted suits, sports jackets, coats and knitwear; for summer, winter, rain and shine. Smart outfits and casual outfits, classic combinations and unusual ones. You can scroll through them all, and refer back whenever you want. And of course new outfits will be added constantly, every time a new one is featured on the main site. The page is here, and it is also in the Style menu of the site's navigation bar. It was fun going back through the archive and collecting the images together. There were many I'd forgotten. It made me realise how often I wear green ties, how little I wear white shirts, and how many of my favourites feature A&S double-breasted suits. 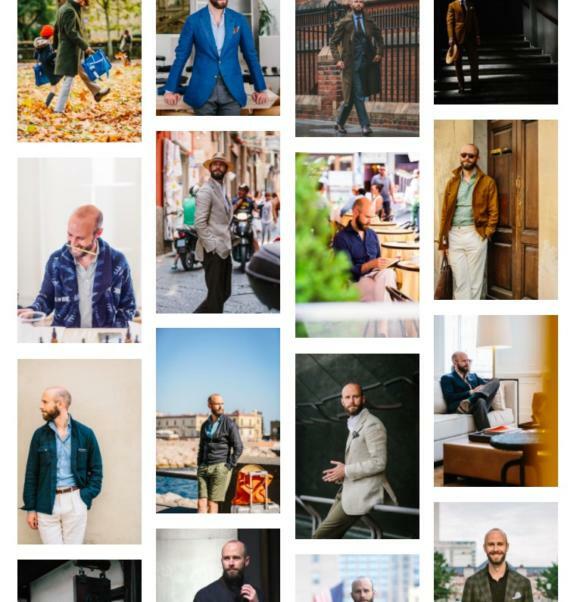 I hope you enjoy the Lookbook, and find it useful. You can follow the discussion on The Style Lookbook by entering your email address in the box below. You will then receive an email every time a new comment is added. These will also contain a link to a page where you can stop the alerts, and remove all of your related data from the site. Lovely idea and great trip down memory lane. Any particular one(s) that stuck out to you as extra good (or bad)? Ooo, good question. Perhaps I’ll do a follow-up post with my 10 favourites or similar? That’d be a great read. Excellent selection. Personally, I think that every man should create for himself a set of clothes for different purposes. But now it is very difficult because a lot of the same clothes and the trends of modern men’s fashion are terrible. A men is first and foremost a gentleman and a style of clothing that must match this. But it is important to choose the right clothes. They should be correctly combined. In addition, it is very important men’s accessories. Where can I find more useful information on how to choose the right things for men’s style? I will be grateful for the help. Since there is a lot of information and it is difficult to find useful information. I’m pleased you think it will be useful Drake. All my posts on this subject are under the ‘Style’ category. You can see it here. Absolutely. Looking at something that is about 11 oz, hope that should be enough whilst keeping cool-ish in spring and early summer? Extremely useful. Note that the overtitles and links work on desktop but not (yet?) on mobile. On my iPhone, every time I touch an image it just brings me to the top of the column. No title or link. This should be fixed now, it was related to iOS so only Macs hopefully. If anyone sees any similar issues, please do let me know. Inspired idea to do this; it certainly will save a bit of searching around for ideas (based on sometimes uncertain memory). Having had a quick look through would you say your personal preference/style has evolved i.e. Slowly but gradually changed or are there certain revolutionary points where a particular garment, maker or whatever suddenly and radically changed your view? I think there are a couple of turning points – eg having my first Neapolitan jacket, at Rubinacci, or my first piece with Davide at Gieves which just made me want to work with him again and again. But in general the style things are all evolutions – such as wearing a grey shirt for the first time, and liking how subtle yet distinctive a style it was. Then gradually adding more in different weights, different collars, etc. One change I’ve spotted is that you haven’t worn glasses in a picture for quite a long time whereas you used to quite often. Is there a style aspect to that and/or to do with a change in personal preference? Fantastic. You always post content that is generally good but this concept is one of the best things I’ve seen in a long while on any website. Nice idea. Links not working on I pad pro, however. Thanks – sounds like a bug as per the reader above. If you tap the image for a little longer, holding the finger down slightly, does the title and link come up? I suggest looking at your settings – it’s fine on Safari on my MacBook Pro and Air. Simon: well done. It works if the image is not tapped but “held”. Interestingly looking through all of the looks it is similar aesthetically and consistent the looks are. They look like they belong rather than just being various looks like a fashion brand would present. I expect your full wardrobe resembles the Selfridges stock room in terms of size but the look-book actually shows how many looks you could create with a small-ish capsule wardrobe. I appreciate that in some of these pictures you are wearing different but similar items (i.e Cream Trousers in different cloths and weights) but for the average man looking at this he will see a pair of cream/ beige trousers and what he could create with one pair. Wonderful idea! The looks are all great, but I guess it was a long way to get there and you will have some items in your wardrobe which were maybe a mistake… and maybe the most readers will have similar items. Wouldn’ t it be a good idea, if we share our lapses in tailoring? For me it is sometimes hard to imagine how the suit will look like with the picked cloth…cause you have only a small sample. 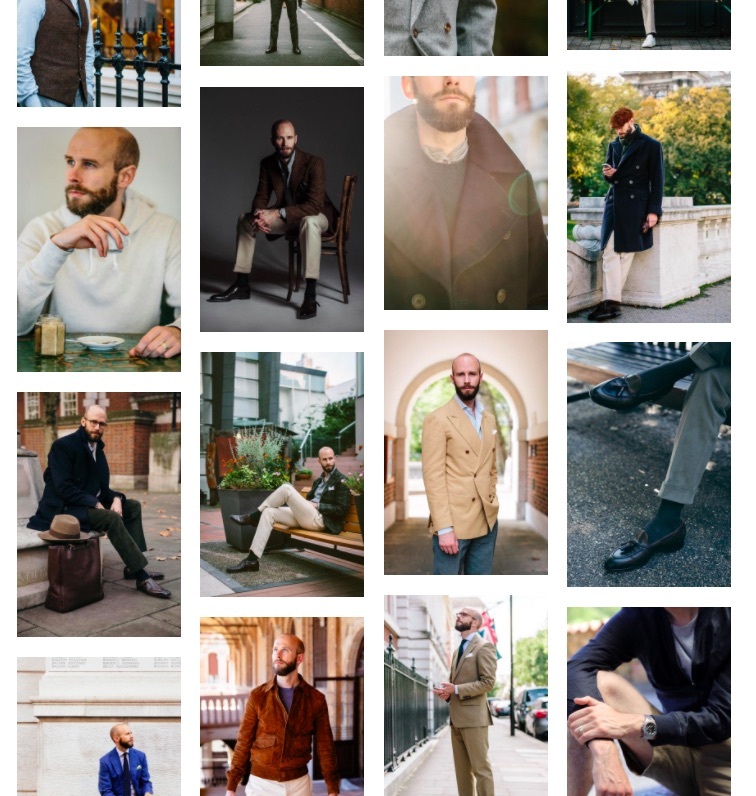 Two years ago I thought a light brown linen suit would be a good idea…. Now I have a bespoke “green” linen suit ( it seems the cloth had a shade of brown but is green), the cut is fine and the trouser could be worn seperate, but with the jacket the suits looks a bit like military style. This is wonderful. Thank you. Being able to read the articles behind each piece really allows one to understand a look instead of just admiring it. Have you thought of adding some type of filter so we could search the looks by season, color, or business/casual? I’m trying to decide what I should add to my wardrobe as we go into spring and summer. It seems the the last post to load is “And another” from Jan 11th, 2013. Below this one it tries to load but nothing happens. Checked on both Windows 7 with Firefox and Android with Chrome. That is the last image – there weren’t really any profile shots before then. Thanks for the tech info though! Ha, as a long-time reader I should have known better! Keep up the good work, this idea is splendid, as is the entirety of PS. Maybe a post on how you organize your closet? With all the great article of clothings you have it must be a nightmare to store them? Also, do you have cloths that you just dont wear as often anymore? Searched your website for “closet” because I was hoping that you may have provided photos of what your idea of ideal closet organization would be. I’d like to see how you maximize your vertical/horizontal closet space and how you categorize, organize and curate depending on the season. Closet lighting, air circulation and spacing, cedar lining? Where and how do you store off-season clothing? Other issues you could perhaps address include your preferred hangers/shoe trees (e.g. Hanger Project, Butler Luxury, etc), organizing and storage of shoe care equipment (creams/polishes/brushes), if you use a standing valet to allow your jackets/trousers to air out prior to hanging them back on the rod, if you use a steamer wand, how you store/organize knitwear and folded clothing, neckties (rolled or hung), hats, gloves, umbrellas, pocket squares, scarves, cuff links, watches, glasses. Many thanks! A good list to work on – thanks! Wow! Very much appreciated Simon. Thank you. Dear Simon, when will the Panico article be coming out? Very much looking forward to. Not for a few weeks I’m afraid – there’s a queue of other things. My wife always checks to see if what I decide to wear in the morning looks as though it would pass your test. Thanks for bringing a peaceful start to the day in our house. We’d be lost without you. I can only repeat what all the others said – this lookbook is a great idea! Especially since it’s not only pictures but linked to the related articles. This is fascinating and is extremely well done. As we all know, there is nothing ‘ Permanent’ about Simon’s style because the nature of his blog and business means that he is effectively trying things on our behalf, allowing us to make informed decisions. In the execution of this mission he veers around all over the place but that’s OK because I’d rather he made the faux pas for us than having to part with hard earned wonga and suffering buyer’s regret. To his great credit, he has introduced me to some phenomenal artisans – Begg & Co, Equus, and Cashmere knitwear services to name but three. I have also bought some great products on his recommendation – Friday Polo, Every Day Denim, PS neck square, PS Trench to name but four. He also, knows a huge amount about quality and the manufacturing process. For all of the aforementioned I am and will remain eternally grateful. 1) When it comes to suits, nothing betters the A&S double breasted for Simon. The drape looks great and frankly, all of the others look second best. They really do look terrific. 2) Simon looks great with something at the neck. Be it a tie, a PS square, a scarf or a roll neck or round neck sweater with shirt. This is because he has a long neck and is folically challenged. Conversely, the open necked look doesn’t work because everything is skin. An exception can be made for summer albeit a tan and a hat willl always enhance. 3) Hats look great on Simon. 4) Light jackets and dark trousers don’t work for Simon. Nor do they work for anybody else. Don’t ask me why that is. The tailoring can be perfect and the colours can be a theoretical match but, it never ever works. It always makes us look like a game show hosts. This is an inescapable fact. Unless you want to look like the late Bob Monkhouse, steer clear. 5) Blouson jackets in suede, leather or anything else, just don’t work on Simon. He is just too tall and they make him look all legs. I know this is bad news because some of the garments are very nice and he doubtless likes them. But they just aren’t for him. Hey, some of us vertically challenged types have to have something that makes us look good ! 6) Drop the school boy look – hooded tops, red watch caps, duffle coats, knife throwing cardigans and white trainers are OK for a belly laugh but they just don’t work on anybody over the age of 16 and take us into the realm of parody. No place to be when it’s all about style ! 7) Continue to resist being influenced by anything at Pitti. The delegates are invariably a bunch of affected, self obsessed Wassocks who wouldn’t know real style if it got up and kicked them in their bottle & glass. All said though, great work and the look book is a fabulous idea. Really enjoyed the style lookbook. Many of the ways in which you combine jackets and trousers from different makers made me wonder the following: do you think its possible to commission a bespoke suit with one tailor creating the jacket and a different tailor creating the pants, in the same fabric? Say a suit composed of a Cifonelli jacket and Ambrsoi trousers? Yes, absolutely. As long as the cloth is the same and you’re aware you don’t want (for example) a very short jacket and very low-slung trousers, then that’s fine.